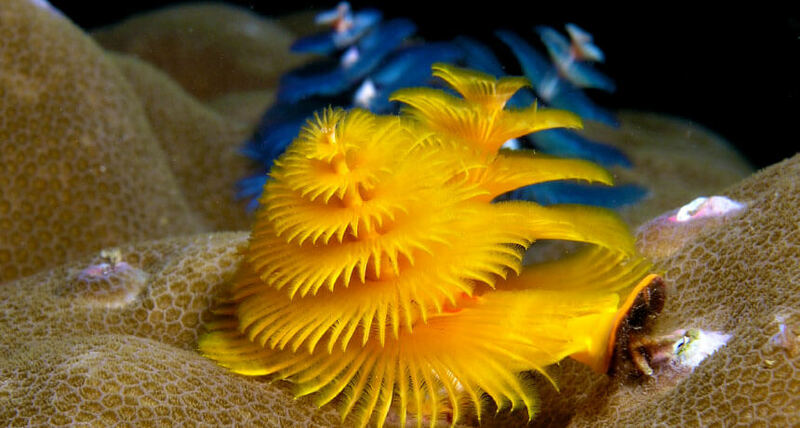 Christmas tree worms have eyes “in a really silly place,” says Michael Bok. Which is part of their charm. This widespread marine worm (Spirobranchus giganteus) gets its holiday nickname from its gills: a wildly colored pair of tapering, feathery spires that protrude from the top of the worm’s buried retreat like ornamental trees. Bok, of Lund University in Sweden, says he has seen worm gills in red, orange, blue, yellow — even stripes. When a shadow looms, the Christmas tree gills drop down into the protective tube where the rest of the worm hides. Yet the eyes that check for scary things lie beneath the branches like forgotten presents. To see the bright orange compound eyes, “you have to kind of sneak up on them and look at them from the right angle,” Bok says. That tucked-under spot limits what those eyes can do, because they can only see directly in front or behind. To human thinking, the top of a tree seems a better place for lookouts, and another kind of fan worm does grow compound eyes there. Orange compound eyes are easier to spot in a young Christmas tree worm with sparse gills. But Bok relishes the way the gill eyes in Christmas tree worms and other fan worms seem so improvised, such odd mixes of features cobbled together. “These things are their own evolutionary tangent,” he says. Bok is exploring fan worms’ barely studied vision, possibly the only case of animals growing eyes on their gills. Fan worms have some rudiments of a more typical visual system. Like other worms, some have patches of light-catching compounds on the segments of their bodies, even their tails, and a lump of light-sensitive tissue in their heads that monitors light-dark rhythms. But hiding in tubes, those visual bits seem useless for detecting danger. So the gills, which also double as feeding tentacles, went visionary. Evolution scattered them with light-catching molecules or even eyes. This took some doing. The nerves from these gill eyes don’t go to the usual optic section of the brain. They connect to another, less-characterized area not usually thought to be involved in vision. And the light–sensitive opsin proteins in the eyes aren’t typical eye compounds, Bok is finding. They are a form of opsin hardly ever found outside the brain.